A complimentary shuttle service is offered between the terminals at Los Angeles International Airport 24 hours a day, arriving at each terminal every 12-15 minutes. The shuttle also transports passengers between the economy parking lot C and the Metro Green Line Station. Travellers intending to use this service should look for the blue LAX Shuttle and Airline Connections sign on the lower level of each terminal. The shuttle routes are labelled with their own letter and stop at different locations. Route A stops at every terminal, route C takes passengers to and from parking lot C and route G transports travellers to and from the Metro Green Line station. This service offers a regular service seven days a week between Los Angeles LAX Airport and Irvine, Union Station, Van Nuys and Westwood. No reservations are required and all buses drop passengers off on the upper level of each terminal. Travellers can board this service from the lower level under the green â€œFlyAway, Buses and Long Distance Vansâ€� signs. Roadrunner Shuttle offer a service to Simi Valley, Ventura County and Santa Barbara County and picks up passengers from the lower level. The Metro Green Line station is accessible via a free shuttle bus which picks up passengers on the lower level of each terminal at LAX Airport. The same shuttle (C) transports passenger to the Metro Bus Center where city buses serve the Los Angeles area. The Information Display Board (in the baggage claim area) shows the latest times and news. There are other public bus authorities serving Los Angeles International Airport: these are Culver City Bus Lines, Santa Monica Big Blue Bus and Torrance Transit. Passengers can pick up these buses in the Metro Bus Center in economy parking lot C.
Antelope Valley Airport Express â€“ Goes to Newhall, Palmdale and Lancaster in the Antelope Valley. Mickey's Space Ship Shuttle â€“ Takes passengers to Universal Studios, Knotts Berry Farm, all Disneyland Anaheim resort hotels, O.C. 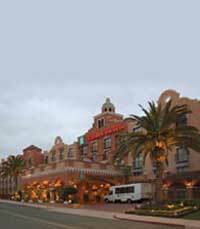 Convention Center, John Wayne Airport, Buena Park, Garden Grove, Huntington Beach and San Clemente - (714) 642-5399. Santa Barbara Airbus â€“ Goes to Santa Barbara, Goleta and Carpinteria. Shuttle One - Travels to Disneyland, Knottâ€™s Berry Farm and hotels in the Anaheim, Buena Park, and Garden Grove area - (800) 400-7488. Ventura County Airporter â€“ Takes travellers to Ventura and Oxnard. Prime Time Shuttle and SuperShuttle offer services from Los Angeles International Airport to all counties in southern California.